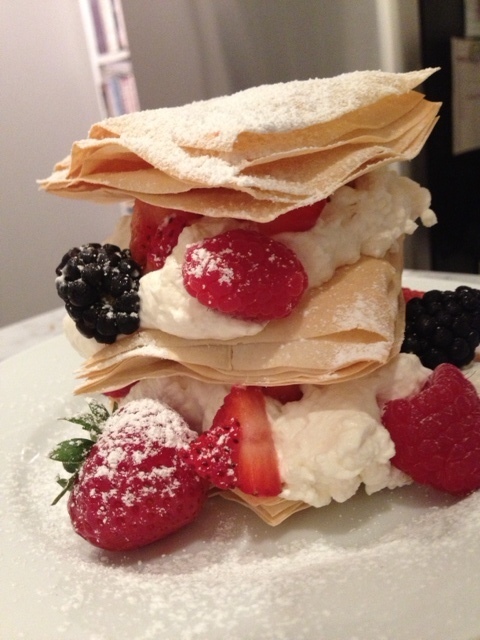 Berry Napoleons: A Step By Step Guide To Creating This Easy Dessert In Minutes. 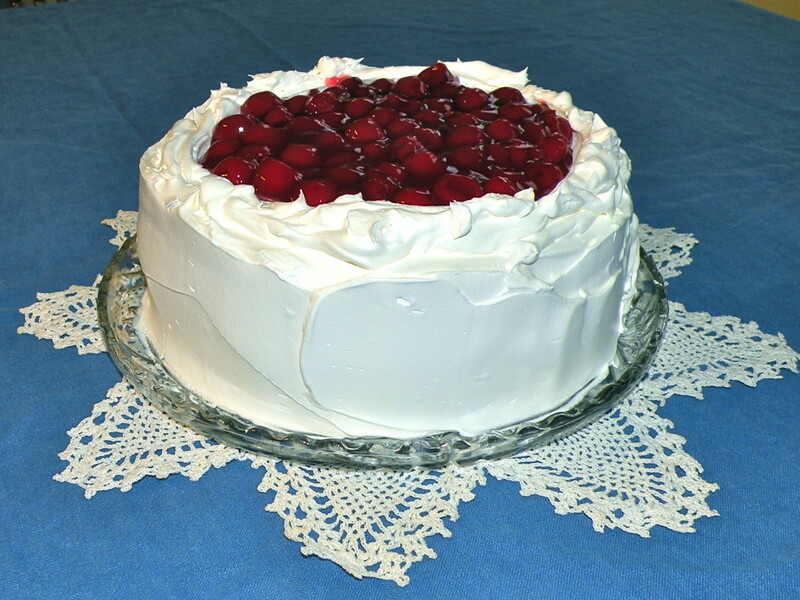 A Napoleon is a French pastry. 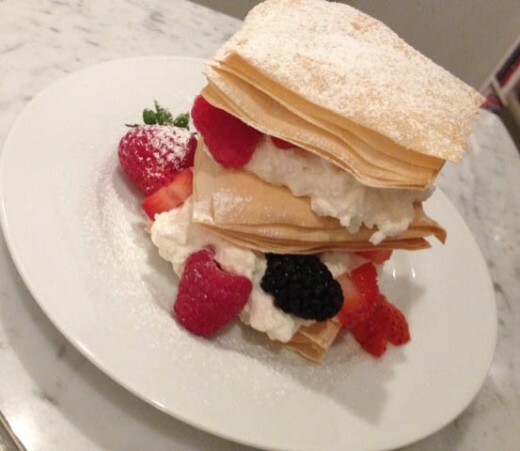 More formerly known as the mille-feuille, the Napoleon is traditionally three layers of puff pastry alternating with two layers of pastry cream, sometimes replaced with whipped cream. 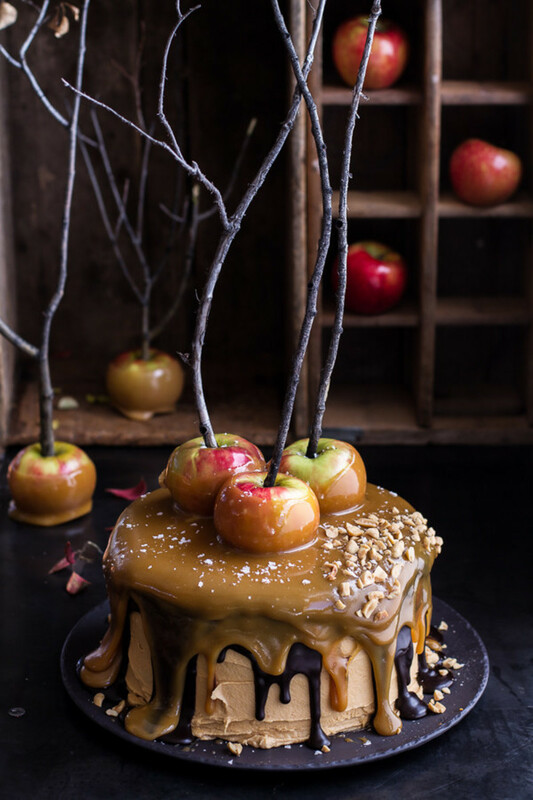 The top layer is most often glazed with a simple icing and decorated with a bit of chocolate. This is a far simpler recipe compared to the more formal looking dessert found sitting behind the glass of your local bakery, but just as tasty. The wonderful variation of texture in this dessert is due, in part, to the crisp layers of phyllo. Phyllo is a paper-thin sheet of unleavened flour which can be used for both sweet and savory recipes. 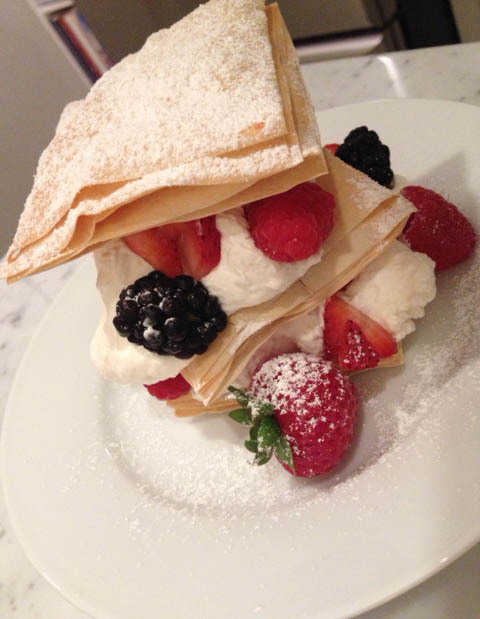 Making your own phyllo dough requires some skill, but using store bought phyllo allows you to make some very impressive desserts like these Napoleons. NOTE: Depending on the size of your stacks and how many layers you make your Napoleons, this dessert could be served to 6-8 guests or an even larger crowd. Preheat oven to 375 degrees F. On work surface, place 2 sheets phyllo one on top of the other; lightly brush top sheet with melter butter. Top with two more sheets phyllo; brush with butter. 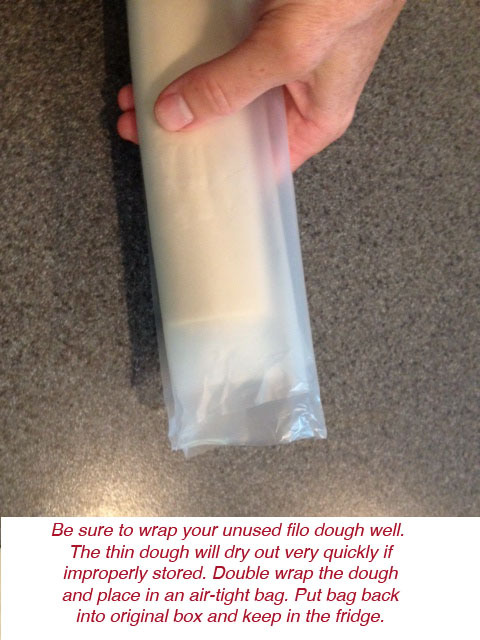 Continue this same process using two more layers of phyllo and butter. 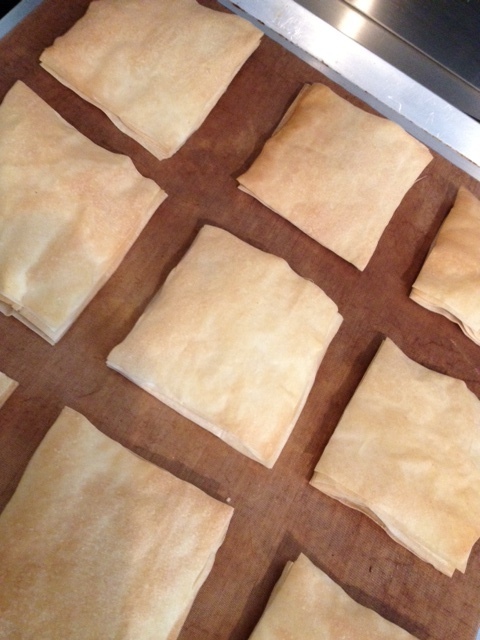 Cut layered phyllo sheets lengthwise in half. Cut each half into six pieces. 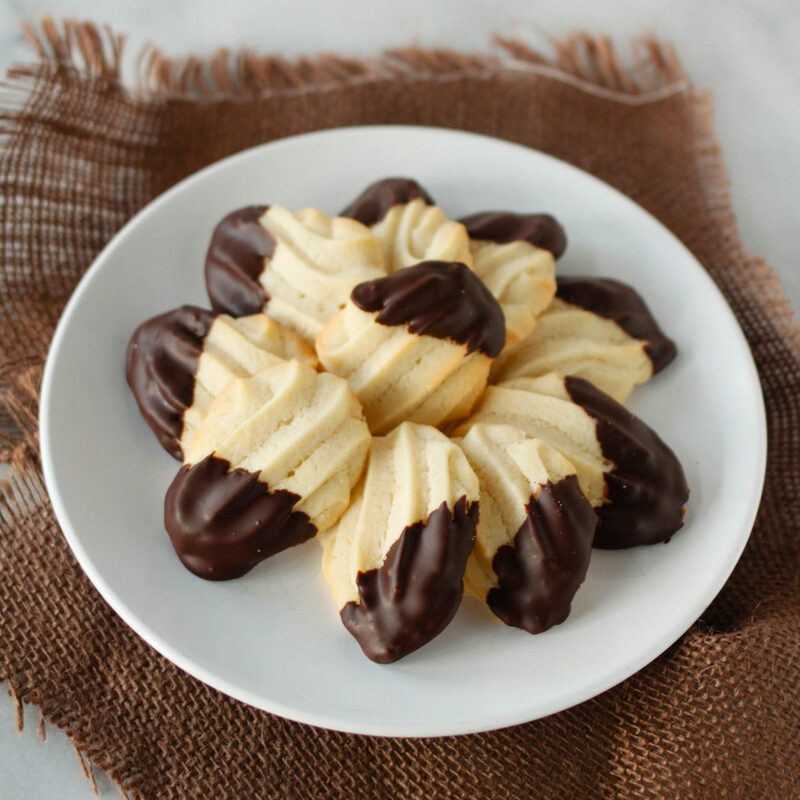 Place phyllo stacks on large ungreased cookie sheet; bake 10 minutes or until golden. Cool on cookie sheet. Mix cheese, milk, vanilla extract and 3 tablespoons of confectioners' sugar on medium speed until smooth and spreadable. Place 1 rectangle of phyllo on the center of 6 dinner plates. 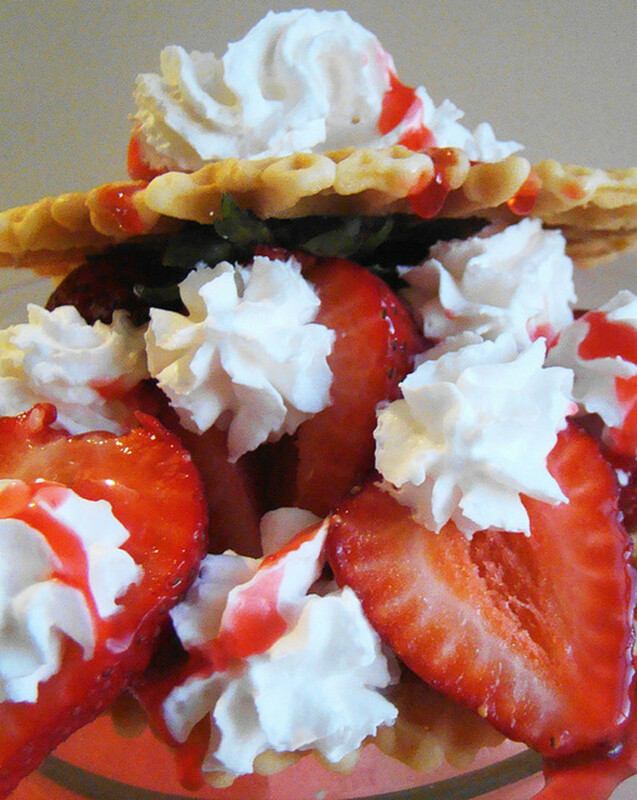 Spread half of cheese mixture on each of the 4 phyllo sheets; layer sliced strawberries on top. 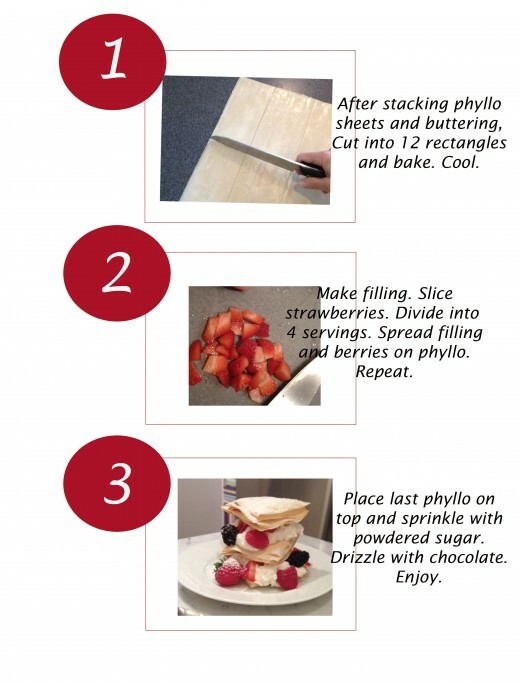 Place another rectangle of phyllo onto each serving and spread with remaining cheese mixture and strawberries. Place the last piece of phyllo on each serving and dust generously with powdered sugar. 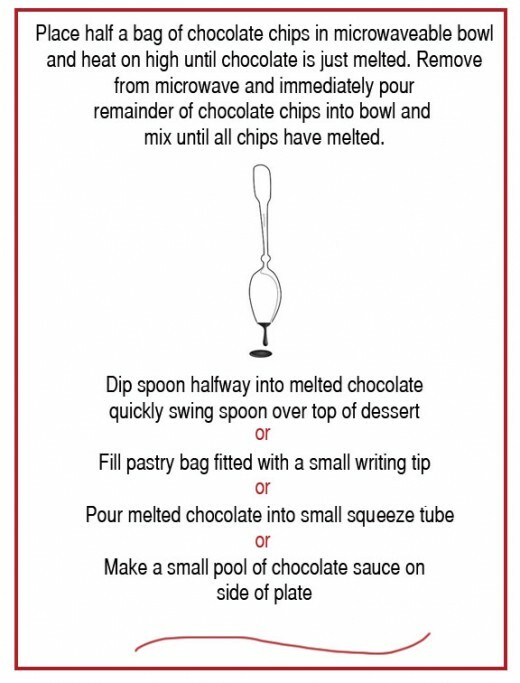 Pour melted chocolate (slightly cooled) into a small decorating bag or squeeze bottle. Pipe or squeeze chocolate over the top of each Napoleon. 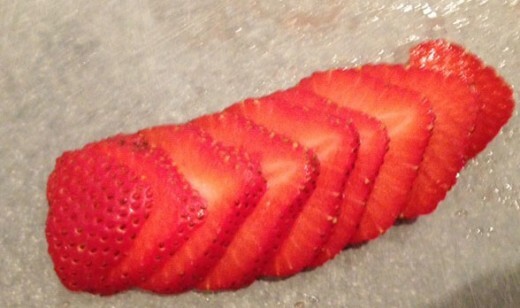 Sliced Strawberries Work Equally As Well As Chopped Berries. Mascarpone Cheese, Ricotta or Neufchatel Can Be Used For This Recipe. NOTE: I didn't brush my filo (phyllo/fillo/filo are all correct) dough with an abundance of melted butter which is why my stacks (as you may notice in the photos) are very crispy. If you choose to use more butter, the stacks will stay more closely together and be a firmer stack. 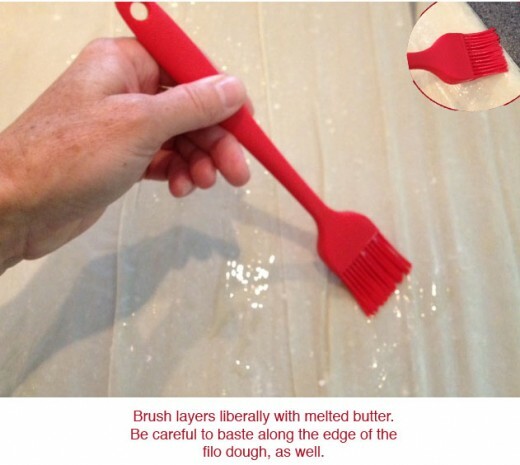 Pastry brushes are an essential kitchen tool. I have had the nylon bristle brush for quite a while now. Recently, a friend purchased this red silicone brush for me and I love it. Using a bristled brush requires a good hand wash. This type of brush is prone to bacterial growth if not cleaned and cared for properly. It's important to dry this kind of brush thoroughly, as well. Over the years with wear and tear, the bristles occasionally fall out of my brush. Because of their color, it can be difficult to notice them on an uncooked pie. 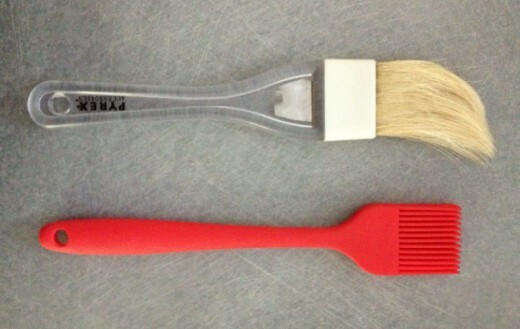 The silicone brush is heat resistant, easy to clean and dries quickly. NOTE: I decided not to drizzle chocolate on my Napoleons this time. However, if you prefer to use chocolate, it does make a wonderful looking dessert. 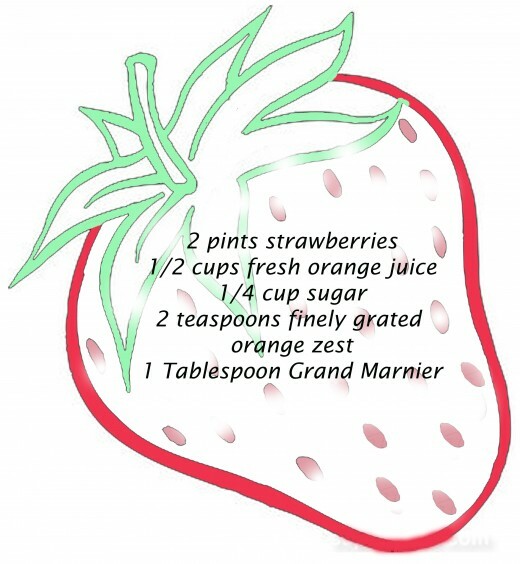 Another nice sauce to serve with your Napoleons is this strawberry/orange sauce. 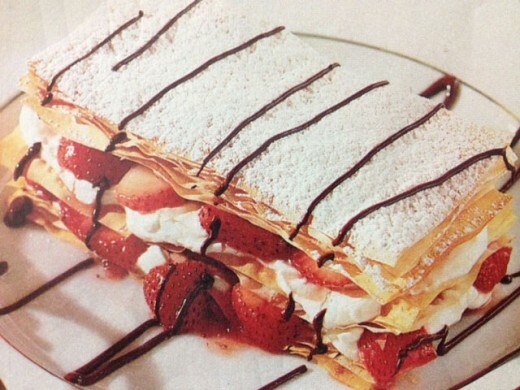 You could also make your Napoleons with strawberries and orange segments. Serve this sauce to the side. 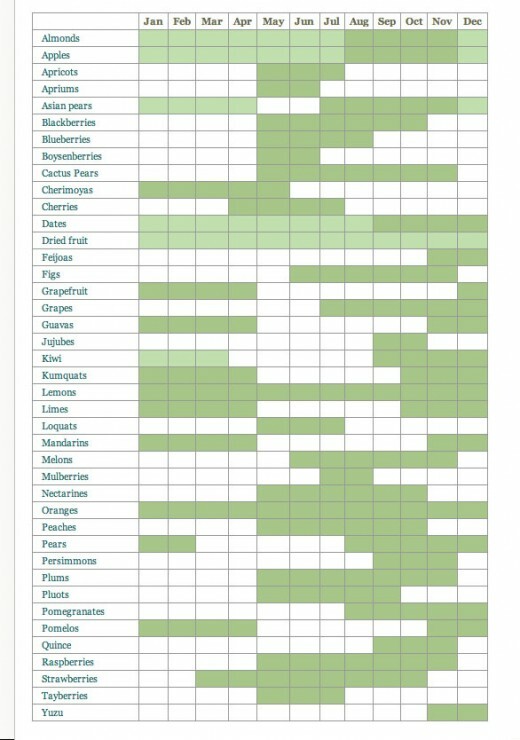 Below, you'll find a chart that indicates which fruits and berries will be available during which months. 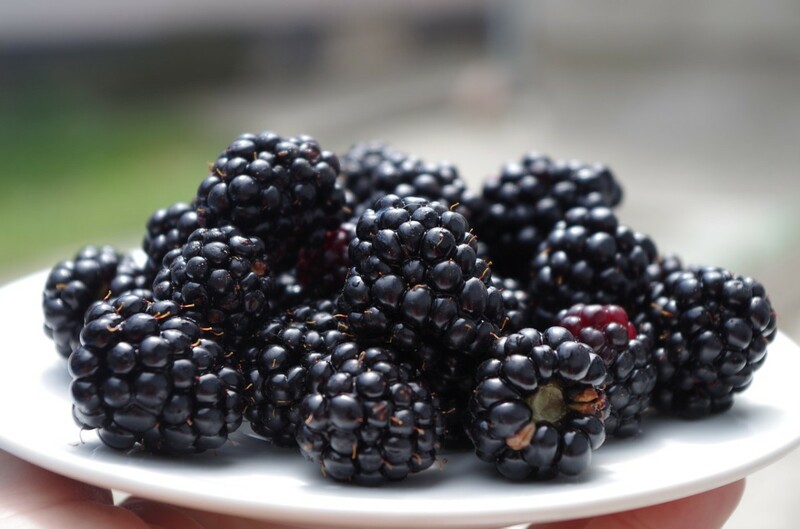 Fruits at their peak taste the best. 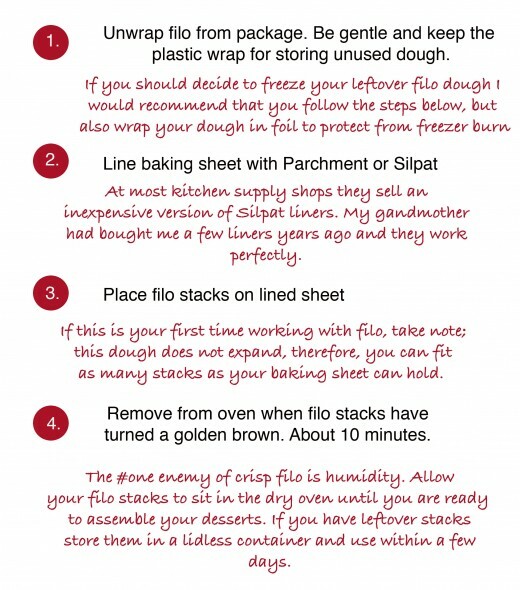 Thicker phyllo dough can be used for a number of different recipes, but it makes a lovely Baklava. Would You Like To Know How To Make SAVORY Napoleons?